Doom‘s original release followed Apogee’s shareware model. You downloaded the first episode, or paid a small amount for a disc of it at the local software store’s counter. If you chose to buy the full version, then you sent in the money and received a copy in the mail. This was the only way to get the full game, and with Doom II getting a proper boxed release, id decided the original needed one as well. Hence, The Ultimate Doom. I’m not going to cover the first three episodes, because they’re simply re-releases of the original registered version. However, as extra incentive for both newcomers and Doom vets, Ultimate Doom contains a new fourth episode – Thy Flesh Consumed. It’s the last group of levels id themselves would officially create before handing off mapmaking duties to the community in Final Doom, and it’s an interesting look at how they chose to revisit the original campaign post Doom II. Which is to say, they made it much harder. Whether from fan feedback, or their own personal opinion, id’s focus at this point was clearly on giving a challenge to the game’s vets. Presumably, they felt the original three episodes had newcomers well-covered. People who play more Doom than I do (I know, right?) rank the first two levels among the hardest in the entire series. 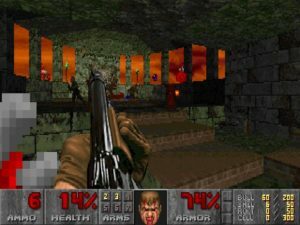 Final Doom would later take significant heat for its punishing difficulty, but everything seen there – from low supplies to boss monsters appearing in regular levels – was introduced in this campaign. Some examples, you say? All right. The first level has no health kits on the highest difficulty, and only a scant few on lower ones. How tough a time you’ll have is basically determined by when a large group of monsters in another room stumble into some teleporters – if you end up surrounded, it’s over. Not to mention, your ammo supplies are extremely limited, as this is the first level. Level 2 puts you in a big, open fight right at the start with no cover and only lava ahead of you. You’ll be trying to hold back five to six floating Cacodemons with nothing but whatever shotgun and pistol ammo you have left over from the first level. 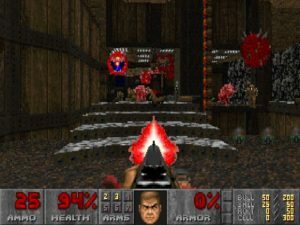 Here, Doom starts to shift from the run-n-gun action most people know it for, to the kind of “combat puzzle” gameplay exemplified by The Plutonia Experiment. Luck starts to factor in, along with preparation earned from many, many deaths. This is the kind of episode where, after a series of difficult jumps and brutal fighting, you’ll end up on a ledge surrounded by five Barons of Hell. Level 6 is based around a central teleporter surrounded by lava. If you don’t precisely manage your environment suit pickups, you’ll be forced to take continuing damage as you keep returning to the teleporter. Your reward will be a fight with a Cyberdemon blocking the level’s exit. 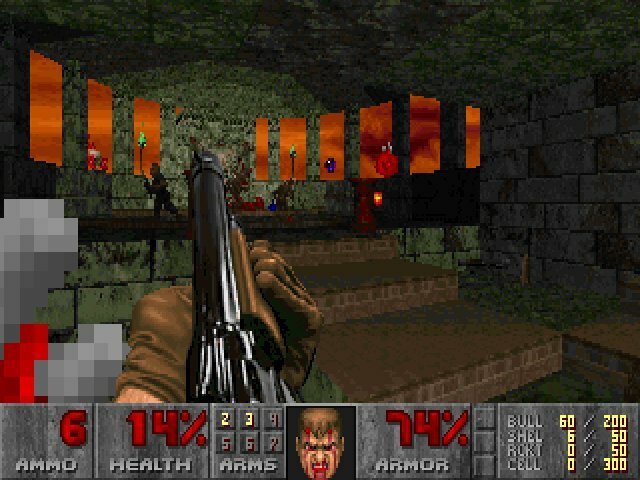 Levels 3, 4, and 5 are surprisingly easy and most like a traditional Doom challenge, which makes me wonder why they stuffed them in the middle. Leading off with the episode’s hardest levels has to be designed to make some kind of a point. And even though you will be able to take something of a breather, make no mistake that it picks back up at Level 6. Bluntly, if you’re not going to enjoy dying, reloading, and retrying until you eventually kludge through the level’s current challenge, then you’re going to want to skip the fourth episode. To be fair though, it’s not exclusively about the difficulty. As this is their final episode, these are some of the best-looking and best-designed levels id put out. Level 7 is a particular highlight of Doom gameplay – an excellent and balanced mix of maze, combat, and traps. Light and shadow feel perfectly used here, both in creating general atmosphere, and creating dangerous corridors. There are no new textures in the pack, save for an omnipresent orange sky in all the new levels. 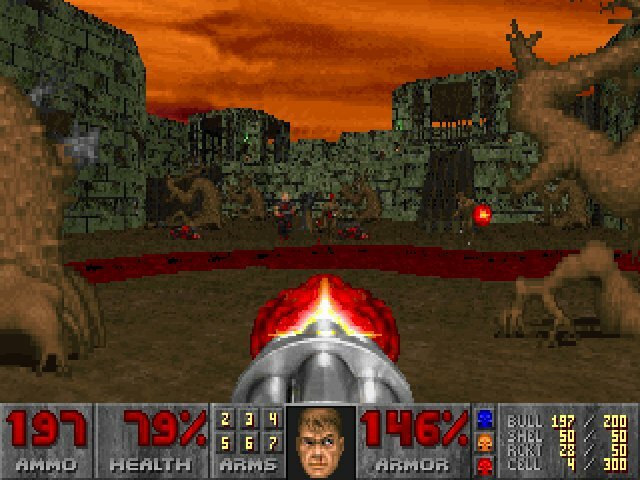 The new campaign does feature entirely new music, which all sounds true to Doom’s now-established style. 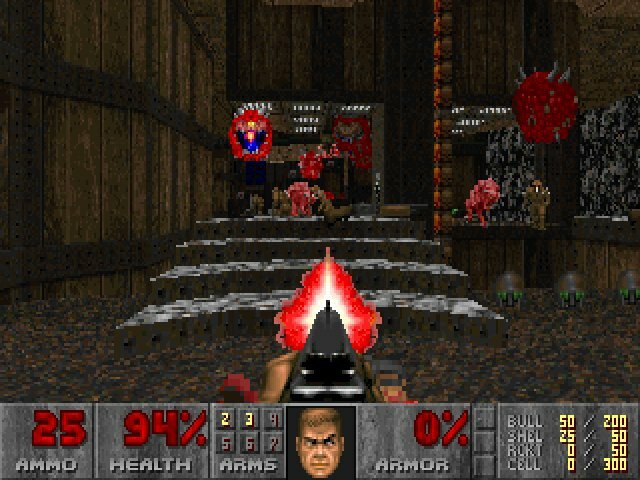 The Ultimate Doom engine also benefits from improvements made to Doom II, bumping the version up from original release Doom’s 1.666 (oh, id…) to 1.9. None of the original levels benefit from this, but Thy Flesh Consumed will see things like switches that require keys, monster-only teleporters, and doors that open instantly – naturally, with monsters behind to give you a good scare. If you’ve bought Doom since 1996, this is almost certainly the version you’ve come out with, making this review almost entirely academic. If you’ve been wondering about that fourth episode though, well, now you know. 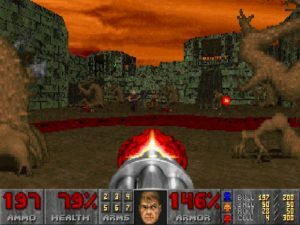 Its stunning difficulty spike is due to a few years of Doom development between it and the first three, and it is entirely built for and intended for the fans that took down Doom and Doom II and still wanted more. Even id seems to suggest that the episode is strictly optional with a throwaway gag plot, but hey… those demons had to pay for what they did to Daisy. More official Doom levels! Some of the best looking and best designed maps in the series. Interesting to see id revisit original Doom, building challenges without Doom II’s new monsters. Questionable reasons to buy this if you’ve already played the original release (but since this is the official original now, likely moot). Fourth chapter is built for the vets only, and will require a lot of painful trial and error. Master levels review please! Great reviews.